While some hunters and sportsmen might prefer the challenge of using open sights when spending a weekend varmint hunting, unless you are professional marksmen, chances are that you will either come home empty handed or lose horribly after a shooting competition and the shooting range. Optical scopes placed on the top of your long gun will certainly increase your ability to focus in on your target. While some rifle can cost you over thousand dollars, there are other options for hunters who want to improve their marksmanship, but who do not want their gear to end up costing more than the gun itself. Scopes or optical sighting devices have become so popular today, that you can find them not only rifles and long guns but also on some handguns, etc. Below, we look briefly at why you should consider choosing an optical scope for your rifle. Why Do You Need a Quality Scope? Before the age of optical scopes, aiming a gun required a good bit of skill. Lining up the iron sights required you to line up the rear sight with the front one, and still maintain enough of a vision to line up those to sights with your end target. With time, iron sights could also go off, causing problems for even the best shooters. Some take much of the difficulty out of aiming a rifle (or any other type of gun for that matter) as all you will have to do is line up the reticle, or the crosshairs in your target. Furthermore, almost every optical today comes magnification, so that whatever you are focusing in on will appear to be much closer, and thus easier to target. The closer your object appears, the more precise your shot will be. One of the cruel aspects of Mother Nature is that as we get older, one of the first things to go is our eyesight. Even if we had perfect vision for much of your youth, by the time you turn forty, most people begin to experience changes in their eyesight. Presbyopia is an ocular condition affecting most people after they hit the four-decade mark and it makes it much more difficult for people to focus on objects that are close up. The loss of this focusing ability occurs mainly because of the hardening of the lens inside the eye. For older hunters or sportsmen shooters, if you do not have 20/20 vision, trying to line up iron sights can be close to impossible. Iron sights require you to switch your focus from a rear sight to a front sight to the end target. If you are trying to focus in on a moving target, your eyes will need to be able to refocus on these three elements, and it can certainly be frustrating due to the condition mentioned above. Purchasing a one for your rifle will certainly improve your aim. You can easily adjust the focus on the ocular eyepiece depending on your particular eyesight until you get the clear picture that you need to focus correctly. Furthermore, it will eliminate the need to switch your focus between different sights and your target. Fortunately, it is not necessary to spend a fortune in order to find a quality optical for your rife. Knowing what to look for in the best tactical scope in this price range will make sure that you get a quality piece of gear that delivers the performance you need without completely emptying your wallet. One common problem with our modern-day society is that we tend to think that more is better. If we pull up at a fast food restaurant and see that triple bacon burger is the same price as the single bacon burger, most of us would choose the former. Skyrocketing rates of obesity, however, should be enough to prove that more is certainly not better when it comes to greasy fast food. Many novice hunters and gun enthusiasts, when reading through product magazines, will almost certainly be drawn to products that offer super high magnification ratings. Many of us might think: “Why not buy the one that has up to 25x magnification when its the same price as the other products that only goes up to 12x magnification. The problem, of course, is that most of us are never going to be hunting snow leopards in Siberia where we could potentially need a super powerful lens capable of zeroing in on a target from several hundred feet away. For deer hunters, varmint hunters, or enthusiasts who simply want an advantage at the shooting range, choosing one with a lower magnification rating is perfectly fine. Take for example a deer hunter. If a deer hunter were trying to zero in on a deer that was only about 100-200 feet away at dusk, a more powerful optical would end up actually making it harder to get a good shot. The higher magnification at a close range subtracts from your exit pupil size and the available light, which is important when hunting during cloudy days, early mornings, or evenings when a light is at a premium. Furthermore, the lowest end of a high-mag scope may still make it impossible to get a good aim on your target. Instead of seeing the whole deer, you might only see a patch of fur that might be the deer, or might be the bark on the tree next to where it is standing. A good hunter or gun enthusiast will tell you that the best gun is often the one with the most simple and direct design. Today, unfortunately, many manufacturers are including a wide variety of different features, many of which are outright unnecessary and even frivolous. For example, you probably do not need a lighted scope unless you are an Army Ranger or Navy Seal. Giant turrets and bubble levels are other bells and whistles added to many that are more for decorative purposes than for anything else. In many cases, the manufacturer of an inexpensive product might add several of these extra “features” in order to cover up the shoddily designed optics, which are undoubtedly the most important part. When searching for them, an alarm should go off in your head any time you see a product that is selling these frivolous extra features instead of focusing on the most important optical elements of the product itself. When we buy tires for our cars, most of us simply have no idea what all those numbers on the sides of the tires actually mean. The same can be true for hunters when searching for one. Make sure you understand what you are buying. Let us imagine one that is advertised as a 4-12×40. This would read as a “four to twelve by forty” scope. The first two numbers are related to the range of magnification. The four refers to four times power and the twelve refers to twelve times power. When set at the lowest magnification, this bad boy will allow you to see an object four times closer than what you would normally see with the naked eye. Similarly, the highest magnification would bring an object twelve times closer to your vision. The 40 is the objective lens diameter rated in millimeters. As we mentioned above, many newer products on the market might have huge magnifications such as 8-25 x magnification. As a general rule of thumb, it is usually best to search for products with a wider range of magnification than scopes that simply have the highest possible overall magnification. For example, one that has a range from 3 to 18-times magnification will usually be more useful than another that has a magnification of 12 to 20 because of the larger range. In the United States, the main tubes on most are one inch in diameter. This means that you the scope will use one-inch rings. While it might be hard for many of us to get our head around the sometimes confusing ideas of how optics actually works, it also important to understand the basics of the objective lens in order to find the best scope under 200. To try to keep this simple, larger objective lenses are not always better than smaller ones. The larger lenses will only gather more light when they are set at highest power during dim light conditions. During other times, they offer no other tangible performance benefits. On the downside, larger objective lenses often cause discomfort and can lead to problems with eye alignment. The ring height for larger objective lenses needs to be higher to keep the lens from touching the barrel. This can make it more uncomfortable to shoot as you might have to readjust your self or prop yourself up on your elbows in order to get a good aim. Furthermore, the larger the optical lens, the heavier it will be. Some can weigh upwards of three pounds adding a significant amount of weight to your gun and thus making it somewhat clumsy to use. This bad boy is a great choice for most hunters due to the quality magnification that it offers. With a low mag rating of 3x, you can get quality magnification for large objects at a close range. This is is the normal specs for hunters looking to catch the eastern whitetail deer, though you might want a little bit of a higher range if hunting out West for elk or other larger animals where distances tend to be greater. This bad boy also has excellent sighting speed. The Bullet Drop Compensator (BDC) makes for a truly unique reticle system that will allow you to match your aiming point with the specific bullet caliber that you plan to use during any given hunting trip or a trip to the shooting range. If you planning on hunting prairie dogs or other smaller varmint, it would have been nice if this scope would have increased the upper range of magnification to 12x power. However, for the price, it is hard to beat. The Bullet Drop Comensator gives you open circle aiming points and hash marks from 100 to 600 yards. The Zero-Reset Turrets and the positive click reticle adjustments will allow you to easily maintain your setting. Completely Waterproof/Fogproof for optimum performance even during the worse days for hunting. This scope is manufactured by one of the best and most trusted names for optical equipment. You can get a fully useful scope that comes with the necessary specifications for well under $200. Leupold is another trusted name in the world of rifle scopes. While several of their products are quite pricey, this style is one of the better hunting scopes out there. One of the major benefits of this scope is that it comes with a crystal clear glass that is certainly a step above their competitors. This allows for great clarity in all different types of light modes and throughout the range of magnification from 3x to 9x. Furthermore, the lifetime warranty on this scope should also be appreciated, especially because of the relatively low price tag. Some users have reported having problems with clarity in low light conditions. If you are planning on hunting during the early morning or late evening, this type might cause you some inconvenience. During regular light conditions, however, it performs perfectly. Versatile 3:1 zoom ratio erector system allows you to use in almost any situation. Completely waterproof and fog proof. The Multicoat 4® lens system delivers extreme clarity across your entire field of vision. The nitrogen sealing process will further protect it. Standard 3-9x magnification for a wide range of uses. This product will give you the ability to consistently hit your target at around 300 yards or more, and the clarity that the scope offers is one of the absolute best on the market. 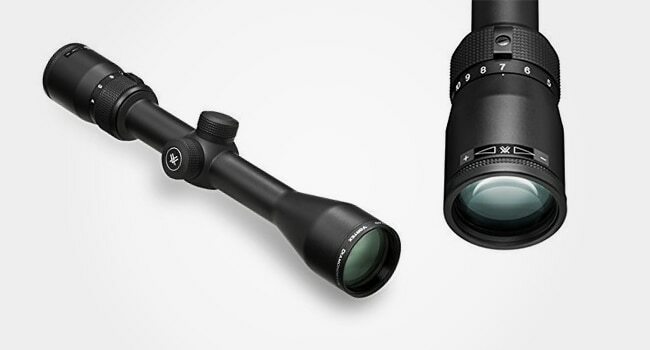 The main advantage that sets this one apart from the other two reviewed above is that it comes with a slightly higher magnification range from 4-12x times power. For people with failing eyesight or who want a little extra magnification, this one should perform well. It is also a good option for elk hunters or hunters of other large game where distances are generally greater than the shorter distances that characterize deer hunting in most of the eastern part of the United States. The eye relief on this is bad boy is much shorter than others and can feel a bit awkward at first. Once you get used to the angle, however, it should not pose a problem. The Dead Hold BDC Reticle offers a customized dot design that will get rid of guesswork on holdover and windage corrections. Argon purging will give you the waterproof and fog proof features that most offered. Bright, crystal clear glass and easy to use adjustments. The 4-12×40 riflescope is ideal for big game, varmint, slug shotgun, and long-range applications. It is not easy to find a quality product for under $200 that offers an unconditional lifetime warranty as comes with this bad boy. There are hundreds of different rifle scopes on the market today, but finding the best one for your personal needs. Knowing how you plan to use the gun will help you find the product with the optimum magnification range. Any of the three scopes reviewed above will deliver optimum performance at a quality price. Pre Made Bug Out Bags: Which Is Better?